How is flatulence and belching usually treated? What does Gasolve Relief contain? How do I use Gasolve Relief? How long does a bottle of Gasolve Relief last? Flatulence is an excess of gas in the digestive tract, particularly the stomach and intestines. This can cause bloating and abdominal pain, excessive belching and passing of wind. It is normal for a certain amount of gas to end up in the digestive system and be expelled by belching or flatus (passing wind). However, for many people - particularly those who have an excess of these symptoms - flatulence can be an embarrassing problem. Many people who suffer from excessive flatulence and digestive gas have to constantly watch what they eat, no longer able to enjoy their favorite foods for fear of causing gas. There are several factors that can cause an excess of gas in the digestive system. Certain foods in the diet are known to increase gas and flatulence. Swallowing air during eating, talking and day to day life will also increase the amount of gas in the gut. In certain people, excessive gas may be an indication of a medical condition such as lactose intolerance or inflammatory bowel disease. Some of the most notorious foods for producing excess gas are vegetables like cabbage, cauliflower and broccoli (cruciferous vegetables), beans, pulses and wholegrains, carbonated beverages and most foods that are high in dietary fiber, especially refined fiber. Smoking, chewing gum, ill-fitting dentures, eating in a hurry or being nervous or anxious can all increase the amount of air that a person swallows and, in turn, lead to flatulence and the associated symptoms. When proper digestion is hampered by disorders like IBS, Crohn’s disease or any deficiency in normal digestive enzymes, flatulence is a common result as excess gas is produced by the gut. Lactose intolerance is also particularly known for causing wind as these individuals lack the enzyme for breaking down lactose - a sugar found in milk and dairy products. Another cause of excess digestive gas is candida overgrowth in the gut. Candida is an organism that occurs naturally in the digestive tract, but can multiply under certain conditions resulting in candida overgrowth and an imbalance in intestinal flora. Candida releases a large number of toxins, resulting in intestinal gas, fatigue and fungal infections like thrush. Causes of candida overgrowth include antibiotic use, excessive dietary sugar and weakened immune functioning. Although prescription and over-the-counter medications are not commonly used to control flatulence and wind, your doctor or health care provider will be able to exclude any underlying medical causes for flatulence. Some OTC preparations are available to release gas from the digestive tract by precipitating belching. While this may produce momentary relief, it does not address the underlying causes. There is a lot that can be done naturally to support your digestive system and address the levels of gas in the stomach and gut. Try to cut down on fizzy drinks and foods known to be a problem for you. These most commonly include beans, legumes, cabbage. Rather (through trial and error), discover vegetables that don’t lead to gas. Always eat sitting down (not standing up) and take your time to eat slowly. Don’t partake in vigorous activity after a meal, and allow your stomach to settle. Natural remedies have been used for centuries to support digestion and for good reason. There are many herbs which are known for their soothing and tonic effect on digestive functioning and using them can make all the difference to digestive harmony after meals! 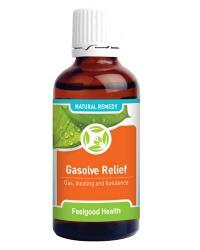 Gasolve Relief is a 100% safe and effective natural remedy for treating flatulence and belching. Just a few drops in a little water or juice will help to settle digestive gas and bring fast relief from flatulence and belching. Carbo. veg. (30C) is a homeopathic remedy well known for its positive effect on digestion, including treatment of flatulence and wind. Carbo. veg. is excellent for absorbing excess gas and toxins in the body and is particularly effective for individuals who suffer from indigestion, sporadic constipation and diarrhea, sour belching, wind and bloating. This remedy will stimulate healthy digestion and circulation and will even relieve fatigue. Foeniculum officinale (Fennel) helps to relieve the symptoms of gas and bloating and also acts as a digestive aid. Fennel can assist in detoxification and prevent a rumbling stomach, as well as many digestive discomforts. Since medieval times this herb has been taken after meals to prevent flatulence, indigestion and colic. Zingiber officinalis (Ginger) has a long history of medicinal use in traditional Chinese and Ayurvedic (Indian) medicine. Modern research confirms its effectiveness in relieving the symptoms of indigestion, flatulence and nausea. Zingiber works mostly in the digestive system by boosting digestive juices and strengthening the process of digestion. Ginger has strong anti-inflammatory and pain relieving properties. Arctium lappa (Burdock) is well-known as an herbal blood purifier and system cleanser. Taking Burdock will effectively detoxify the digestive system, strengthen weak digestion, relieve wind, distension (bloating), constipation and indigestion. This remedy contains less than 1% pure pharmaceutical grade ethanol when diluted as directed and is free of gluten and artificial flavors, colorants and preservatives. Gasolve Relief comes in a convenient tincture (drop) form and is taken diluted in water or juice. Adults and Teenagers: 15 - 20 drops in approximately 1/4 cup water or juice three times daily. An additional dose may be taken at the first signs of acute symptoms. Children: One drop per age year of the child. Safety during pregnancy and nursing has not yet been established. Most people will experience improvement within the first few days of taking Gasolve Relief. One 50 ml bottle will last approximately 30 days at chronic dosage. A 120-day supply (see the Buy 3 Get 1 FREE special) would be four bottles. How common are symptoms of excess flatulence? Between 7% and 10% of adults report excessive belching, bloating and/or passing wind. Passing wind about 10 times per day is average though more than this can still be considered normal. Why do some foods cause gas? Any food that is not completely digested when it passes from the small into the large intestine will be digested further by bacteria in the colon. These bacteria produce gases. This can lead to partially digested food passing from the small intestines to the colon. There are a large number of bacteria in the colon that will readily digest the food further but produce gases in the process. Certain foods contain sugars that are difficult for all people to digest and these include the common “culprits” like beans. Other foods may prove difficult to digest for particular people - like lactose in individuals who lack the enzyme for digesting this sugar - lactase. What else can cause flatulence? Some prescription medications can cause symptoms of excess gas due to the inhibition of particular digestive enzymes. Speak to your doctor about alternative drugs if you suspect your medication is causing flatulence. When do I need to see my health care provider? In isolation, excess wind and symptoms of flatulence are rarely cause for concern. However, if your symptoms are accompanied by abdominal pain, vomiting, bleeding, heartburn or weight-loss, it is important to consult your doctor in order to investigate the possibility of an underlying medical condition. What else can I do to help my condition? Avoid foods that are known to cause excess gas. Common culprits include beans, cabbage, sodas and artificial sweeteners. Reduce the amount of air you swallow by not chewing gum, drinking through a straw or smoking. Eat slowly in a calm environment and try not to talk while you are eating. If you want to increase the amount of fiber in your diet, do so gradually over a few weeks as a sudden increase in fiber intake may trigger symptoms of flatulence. No Burn Combo! Soothes acid reflux and stops gas!